And the dice are not loaded, no way." 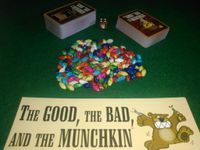 The origional great satirical take on dungeon crawlers; but this time set in the Wild West. 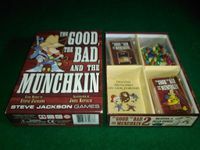 My gaming groups loved the origional, but since I bought this, they've moved on, and Munchkin sadly never hits the table. Also comes with (brand new) beads for tracking levels.